As per Hinduism, nothing in the world happens without a reason. This is an important teaching in Hindu religion. All actions are connected in one way or the other. The story of Goddess Lakshmi cursing Lord Vishnu – May your head fall off – is found in the Devi Bhagavatam which is part of the Markandeya Purana. Lord Vishnu was taking rest after his long battle against demons Madhu and Kaitabha. The Devas wanted to wake him up to take his help in defeating another demon who had stolen the Vedas. Lord Vishnu was sleeping by leaning his head to his mighty bow Saranga. On the advice of Brahma, termites devoured one end of the bow causing the bow string to snap. The bow string severed the head of Lord Vishnu and the head was no longer to be seen. Darkness engulfed the universe and there were evil omens all around. Huge meteorites appeared in the sky. There was volcanic eruptions, dust storms and huge winds. The snapping sound of the bow kept on echoing throughout the universe. All evil forces including asuras came out to celebrate the end of Lord Vishnu. The alarmed Devas on the advice of Brahma offered prayers to Goddess Shakti. Goddess Parasakthi appeared before the Devas and told them that there is a reason for the severed head of Lord Vishnu. She then narrates two incidents that had previously happened and which are directly connected to the disappearance of the head of Lord Vishnu. Lord Vishnu was once in a playful mood and looked the face of his consort, Goddess Lakshmi, and started laughing. Goddess Lakshmi did not find the laughter to be amusing and thought her husband had found something ugly in her face. She became angry and soon she was filed with tamo-shakti (negative energy). 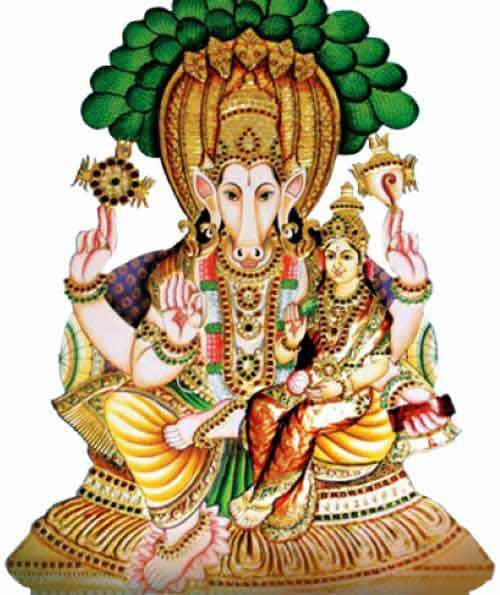 Anger of Goddess Lakshmi soon turned into doubt. She thought Vishnu was comparing her face with that of another woman. It is due to this curse that the Vishnu’s head was severed. Now there was a reason for Goddess Lakshmi cursing Lord Vishnu. A horse-faced demon named Hayagriva had got the boon from Goddess Shakti that he would only be killed by one who has a horse-face like him. Hayagriva had grown into a scourge to all beings in the universe. His aim was to wipe out the Vedas along with it Dharma. It was time to put an end to this tyranny and this is the reason why the head of Vishnu got severed. After listening to Goddess Shakti, the Devas with the help of Vishwakarma, the divine architect, attached a horse’s head to Vishnu’s body. Soon Lord Vishnu stood up and gave a wild neigh which shook the entire universe, explosions were heard all around, high waves from ocean lashed the land and mountains shook. Then there was an eerie silence. Then, the auspicious sound of conch reverberated through the universe. Horse-headed Vishnu flew into the sky and took on the horse-headed demon Hayagriva. Soon the limbs of the demon were pulled apart. Thus Vishnu put an end to the reign of the demon. This manifestation of Vishnu came to be known as Hayagriva and is associated with Vedas. After aim of the Hayagriva avatar was achieved, Vishnu went back to his original form.